This is another very simple dishcloth that you can make. 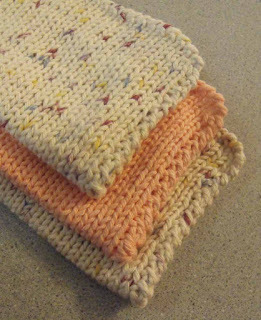 It is especially good for a new knitter and would go great with the other dishcloth pattern that I have posted on here. This one is a bit different and involves learning how to do a backwards crochet edging. It's pretty simple and I've provided videos for you to learn how. You can view the video playlist for this discloth on my KweenBee Crafts channel. Check it out because learning to knit is easier than you think! To make the edge lie as flat as possible, I would recommend that you use a crochet hook that is one size smaller than the knitting needles that you used. For example, if you used size 5 knitting needles, use a size 4 crochet hook. You may need to experiment a bit to see what works best for you. When I make this I use size 5 knitting needles (size 8 if you are in the US) and a size 4 crochet hook (size 6 in the US). You will also need 1 ball of crochet cotton (42.5 g or 1.5 oz.). Gauge: 12 rows stockinette = 2"
Gauge effects the amount of cotton yarn you use and the final size of the dishcloth. I've included links to the basic stitch videos in case you need a reminder. They will open in a new window so make sure you allow pop-ups on your computer! Repeat these 2 rows for 50 rows. 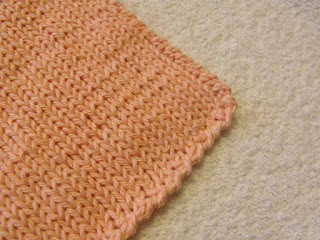 If you want a square washcloth you may need to knit more or less rows. For my gauge it works out perfectly (well, close enough for me). Do NOT break the yarn at the end of the dishcloth. Ch 1. A backwards crochet sound exactly like what it is. Instead of going from right to left you work left to right. You work it exactly like a single crochet, but backwards. Pull up a loop and draw through the two loops on the hook. Repeat. For this particular pattern, along the first edge you will single crochet in every other row. Along the bottom and top edge, skip every other stitch and a half. For example, single crochet in the first stitch, skip the next stitch and single crochet in the space between the next two stitches. Skip the next space between stitches and single crochet in the next stitch. Hopefully the video demonstrated this better. Of course you are more than welcome to alter this pattern as you see fit. 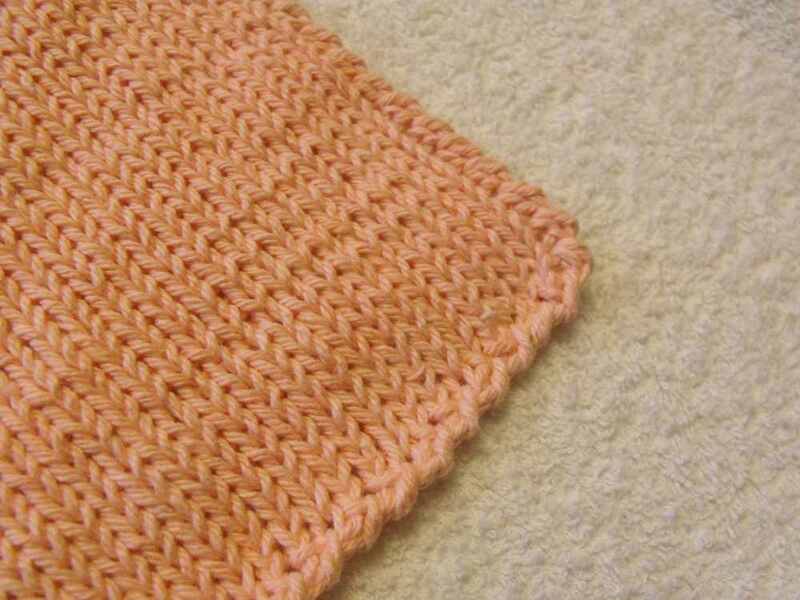 You may want to only knit the washcloth for a garter stitch pattern. It will take more yarn and you will probably have to make more rows. If you have any questions or comments, please feel free to leave a comment or send me your questions at kweenbee_crafts@hotmail.ca. Like the free patterns?? For as little as $12 a year you can help support my work with a small monthly subscription. And since it's always a part of copyright law, you have my permission to use this pattern to sell or give away the washcloths that you create, but you DO NOT have permission to republish or duplicate this pattern for any purpose without my written permission. You are always welcome to link back to this post if you would like to share the pattern, but the content must remain here. I am trying to find the first dishcloth pattern that is advertized on you tube. But could not seem to get to that site. Thank you. It is the one starting with four stitches and working diangle. If you are ever looking for a pattern, I list them all in the column on the left hand side of every page. You can also try using the search feature in the upper right hand corner. It will find all the postings relevant to your search term on my blog.